Sent to Breitbart News by an anonymous source, it features co-founders Larry Page and Sergey Brin, VPs Kent Walker and Eileen Naughton, CFO Ruth Porat, and CEO Sundar Pichai. It can be watched in full above. It can and should be watched in full above in order to get the full context of the meeting and the statements made. ... These individuals, who preside over a company with unrivaled influence over the flow of information, can be seen disparaging the motivations of Trump voters and plotting ways to use their vast resources to thwart the Trump agenda. Thanks for posting - just grazed & fast-forwarded about 2 1/2 minutes of snippet sound-bites. One response: "Eff 'em . . . every single perverted Worldview one of 'em." Not one damn thing in that surprised me one bit, it is merely a case of hearing it from them directly and unedited. The real stunning part is the fact that not a single one of these assholes realizes that their fanatical close minded belief in the unquestioned superiority of their progressive ideology and the hostility and suppression and oppression of unbelievers it spawns is not a textbook definition of fascism and totalitarian despotism. Like Islamists, there is no coexistence with these people, they did us a favor by releasing this. Restance is mandatory, it is them or us and we have to get our asses off the bench. Excuse the language, but f**k you Google. I hope some better tech comes along and buries you. Granted, that's less likely now, as they have done a good job of cementing themselves into a monopoly. Just another faceless left wing giant corporate monster. Controlling nearly all online ads. A very bad situation as it's keeping people they hate from making a living. Remember their late dead motto "don't be evil"? God willing, what we're seeing is Gargoyle's "arc" toward oblivion. Need to bail on the domestic enemies! 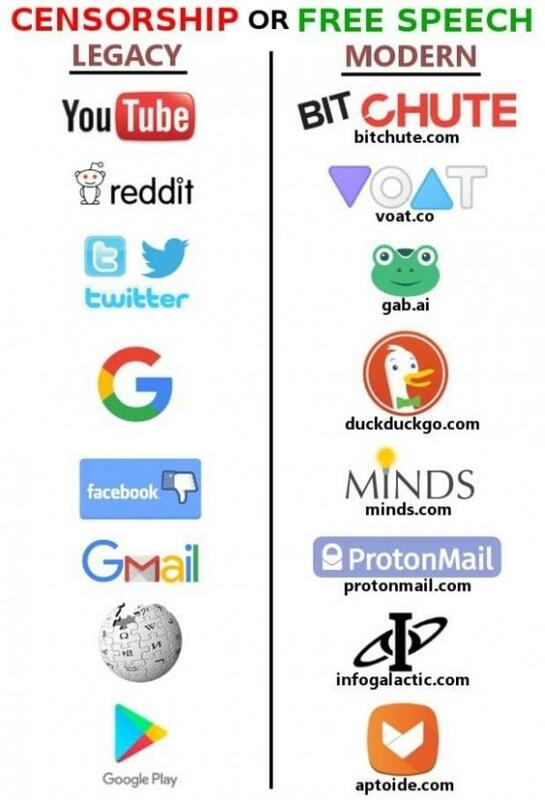 I already use Proton Mail, DuckDuckGo & InfoGalactic, we've talked about Gab...I don't know much about the others but I am very willing to make changes! I just don't know what to do about cellphone, it seems everything is either Goolag-based or iCrap-based! Thanks for the heads up, Libertas. I've already started using duckduckgo along with the Pale Moon browser on Ubuntu OS. At least at home. I'm still chained to MS for work. Now I'll set up a ProtonMail account. Still checking out the Aptoide thing. Seems to be limited, but I'm still digging. Edit: It appears ProtonMail doesn't like Pale Moon. It works great with Firefox, though. I'll be downloading the app to see how it works on my Android phone next. You do realize Google controls Android and I also think Firefox. I'm not sure about Android, but Firefox is open source. Google controls Chrome. Yes, but Firefox platform based on Chrome. Uhm.....Firefox predates chrome by six years. As for krystal, why isn't he gloming onto flakey-flake? He should be the perfect RINO for him. My laptop is an HP. Some time ago, the fan kept revving into high gear for extended periods and the laptop would get very warm, my browser would get hung up, pages loaded sloooowly, so I started checking the task manager for whatever was using all the CPU when I ran across this little gem of a program "HP Touchpoint Analytics Service". I did a search on it and come to find out HP was loading it on via Windows updates and the skinny on it is, it starts and stops "numerous applications, it's client service and installer, console window host, command prompts, timeout-pause command prompt, it's causing a lot of up and down use of anti-malware service executable and local system." It's spyware, says https://www.computerworld.com/article/3238512/microsoft-windows/hp-stealthily-installs-new-spyware-called-hp-touchpoint-analytics-client.html. So, I uninstalled it. Magic. (Double magic, considering how computer-inept I am) I don't need the laptop "cooler" (lots of fans in a base for the laptop) anymore because the fan hardly comes on and all the other bullspit has stopped. I'll have to check my work laptop. Thanks for the heads up, Pan. Damn, Sparky had bad reaction to tainted fish barfed up a mess! The underlying architecture of Firefox was designed for a 2004 internet and it just can’t keep up these days. In fact, at the Pwn2Own competition previously mentioned, no one even tried hacking Firefox. I guess it just isn’t a serious contender anymore. Basically, Mozilla hasn’t made enough recent security improvements for it to be taken seriously. One of Firefox’s biggest shortcomings is that it does not use a sandbox to keep the internet separated from your system. These days I consider a sandbox essential for most users. Every other browser I cover here uses a sandbox of some kind. Basically, it’s time for Mozilla to scrap Firefox and rebuild it from the ground up, much like what Microsoft did with Edge and what Opera did three years ago (see below). That doesn’t necessarily mean you shouldn’t use Firefox anymore. It’s not going to matter much as long as your browsing habits are safe and you’re not installing evil plugins. And it’s still getting timely security updates for the things that they can fix. As always, Firefox’s strongest point is its privacy. In fact, it’s their mission. Mozilla collects very little data and does not trade information on its users. Not to mention that Firefox is completely open source, which none of the other browsers here can claim. That means anyone can open up the source code and make sure there’s nothing shady inside. I like Epic for general and Brave for more secure and private and Orbot/Orfox for ultimate privacy. Time to cut some nuts! When is more law ever a good thing when existing laws are ignored?